These days you have to do everything you can to throw yourself in the public eye. This is one of the reasons that guest blogging has become so popular and I do even accept this here at Bloggers Tech. If you are not familiar with it, things can seem a bit tricky at first. You should have a firm grasp of the concept after you read the following article. The main idea of guest blogging is to go to a blog that is already established with a core audience and where you'll gain reputation through guest posting. Your goal is to write a blog entry that is compelling and unique in an attempt to appeal to these people. If you do things correctly, many members of the audience may come to your site and become a customer. It may sound a bit complicated, but it is actually quite simple. 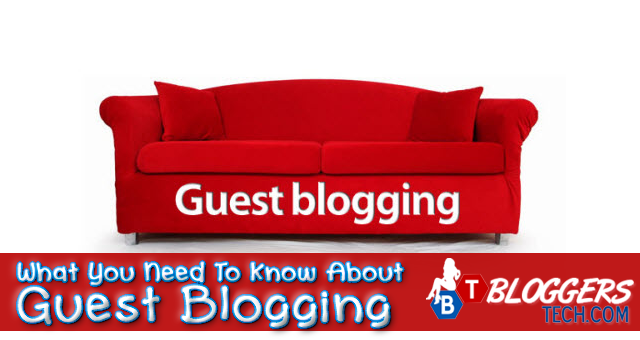 One thing you must do is familiarize yourself with the blog you would like to be a guest on. This will help you create a guest blog idea that the blog owner will love. If they don't find your idea interesting, they will not allow you to be a guest, so you need to come up with something good. Make sure that you let the readers know what your credentials are for guest blogging. This will let them know why they should care about what you have to say. For example, if it is a legal blog people love to hear from people that have a solid background in law. Choose to blog about something that you are passionate about and ideal for guest posting. When people read your content and they get a sense that you have conviction, this will make you a lot more interesting to them. Even so, it is important that whatever you write is in the same niche as the content on the guest blog. This is pretty much all you will need to know if you want to have a positive guest blogging experience. If you do things well, you can look forward to increased traffic to your site.